Oh, Happy Day! And no, I don’t mean that literally. 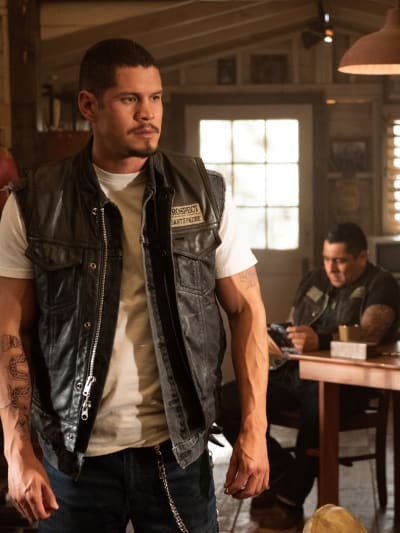 After several teases, Mayans M.C. Season 1 Episode 10 finally revealed the person who was behind the death of Mrs. Reyes eight years ago. The reveal was stuffing. Seriously, it was a major twist that could take Mayans M.C. in so many different directions! Of all the possible suspects on my list, Happy from Sons of Anarchy was not on it. It didn’t even occur to me when he first appeared that he was going to be used in any way other than a brief cameo. Obviously, that’s not going to be the case after this major reveal. The death was eight years ago, and we know from Mayans M.C. Season 1 Episode 1 that Gemma was alive and well then. So that means Jax, and possibly even Clay was also alive. Could the Sons of Anarchy be behind the hit on Mrs. Reyes? Related: Michael Irby Is Having The Ride Of His Life On Mayans M.C. They have to be, right? There’s no way Happy’s involvement in the murder was a solo job. It was the perfect cliffhanger. 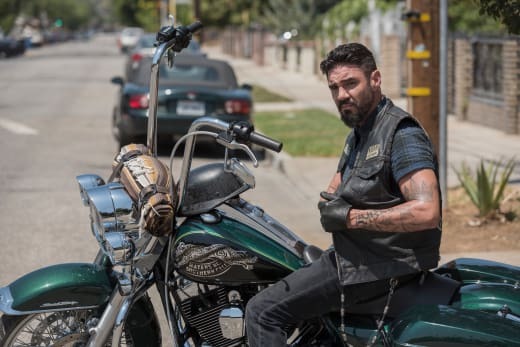 Now, we just have to wait until fall 2019 for Mayans M.C. Season 2. That shouldn’t take too long. The Happy reveal was cherry on top of a delicious sundae. I was worried about this episode considering how good Mayans M.C. Season 1 Episode 9 was. The show has a tendency of being inconsistent. However, Mayans M.C. managed to deliver two top-notch back-to-back episodes and has actor Clayton Cardenas to thank for it. Angel delivered incredible emotional depth. He was a man who was backed into a corner forced to choose between his brother and his morality. Despite being upset with his actions, he chose to protect his brother and killed his cousin in the process to do so. EZ: We’re supposed to be back soon. I picked up Alvarez’s bag and ordered the meat from pop. Angel: We just wasted two feds, and you’re worried about being late to the party? Permalink: We just wasted two feds, and you’re worried about being late to the party? Angel was clearly shaken by what he had done. Killing Jiminez is something he could never take back, and it’s obvious that he’s disappointed in himself for doing it. I don’t see EZ and Angel’s relationship improving anytime soon. Angel seemed so disgusted with EZ. Rightfully so, he feels as though EZ made him do it as much as Potter did. If EZ or Felipe were honest with him about EZ’s deal, maybe Angel could’ve figured out a way to get them out of trouble without having to kill Jiminez. Adelita was the only person who could see his pain, and while I’ve never been a huge fan of hers, I must admit that she and Angel have amazing chemistry. Her love is exactly what Angel could use right now. Adelita: Angel, do you want to stay? Spend the night? Angel: More then you know. But not on a night when I hate myself this much. Permalink: More then you know. But not on a night when I hate myself this much. While Angel couldn’t hide his feelings, EZ was pretty darn good at it. Maybe it was because EZ killed Agent Bowen and not his own cousin like Angel, but EZ remained stoic and cold after their deaths. Does he feel any remorse or is there a part of him that’s happy that it’s all over, and he no longer has to worry about his deal? The conversation between Felipe and EZ at the beginning of the episode felt like possible foreshadowing for Season 2. EZ, you can’t let Potter turn you into a monster. It’s not who you are. Permalink: EZ, you can’t let Potter turn you into a monster. It’s not who you are. Has EZ tapped into his dark side? Especially now that he’s distanced himself from his brother and asked Bishop to sponsor him, he might find himself doing more and more deplorable things for the M.C. Angel protected him from seeing anything too dark up until now. However, now that there is the fracture between them, there’s no stopping EZ from going all in with the club. He might even drop a few bodies just to prove to Bishop that he deserves to be a full-fledged member. Whatever happens, the EZ we knew on Mayans M.C. Season 1 is gone, and Season 2 will introduce us to a different EZ, one who’s a little more broken and damaged. The Reyes family weren’t the only people who made major life changes. Alvarez has officially left the M.C.! It was kind of depressing to see the member with the longest tenure in the club hang up his jacket, but at least he’ll be getting a pay raise! He may not wear the vest anymore, but Alvarez will be back in a much bigger role on Season 2. As Miguel’s personal advisor, Alvarez has even more power and influence then he had before. My friend, I’m so glad you’re here. My father is smiling down on us. I know he’d approve of your council. It’ll be interesting to see how Alvarez adjusts to this transition in his life, and how he’ll interact with the M.C. now that he’s no longer one of them, but instead their boss. Bishop and Alvarez have had such a solid bond, but will there be a conflict between them now that Alvarez is no longer wearing the vest? “Cuervo/Tz’ikb’uul” did a solid job of not only wrapping up stories but also providing new ones for us to look forward to in the upcoming season. And if you thought Kurt Sutter was ruthless when it came to killing off characters on Sons of Anarchy, Devante’s and Jiminez’s deaths prove that you ain’t seen nothing yet. The body count is only going to get higher. What did you think of “Cuervo/Tz’ikb’uul”? How surprised were you about the Happy twist? Do you think EZ and Angel will ever be able to repair their relationship? How do you think Alvarez will adjust to his new role? 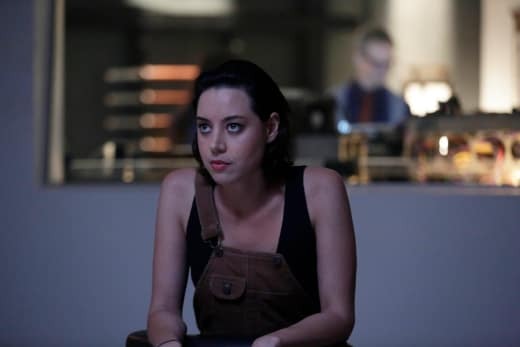 What are you looking forward to seeing on Season 2? Let us know in the comments below and if you need to catch up, make sure to watch Mayans M.C. online right here on TV Fanatic!